To someone who works all night and sleeps all day (that's me) the Winter Solstice is a red-letter day. That's the day on which I have the least chance of actually seeing the sun. Not good. On the other hand there is plenty of inductive evidence that after this solstice the days will start getting longer once again. It's happened in previous years. Probably this year too. Reason to celebrate. Especially for your ancestors if they lived in Northern Europe. And sure enough, just about everyone does celebrate these days - although most wait some days or weeks to begin the traditional party. Blame it on imprecise astronomy. I wonder how native cultures in the Southern Hemisphere celebrated their winter solstices. In June. By the way - the Jewish holiday this time of year has nothing to do with Solstice. We were lousy astronomers. Hanukkah celebrates a religious insurrection. I took this picture one year ago in Mexico. 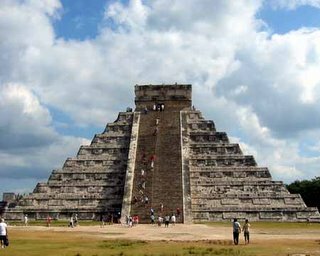 It's the Chichen Itza pyramid - designed by the Mayans to align with the Equinoxes, not the Solstices. There will be an Equinox in three months. Probably.